Are you getting confused about the difference between an axe and a hatchet? By reading this article, you will be able to know axe vs. Although both the axe and the hatchet are cutting tools and appear almost similar, they were designed to perform different tasks. Many people mistakenly choose these tools as the alternative option to each other, resulting in poor performance in wood cutting. 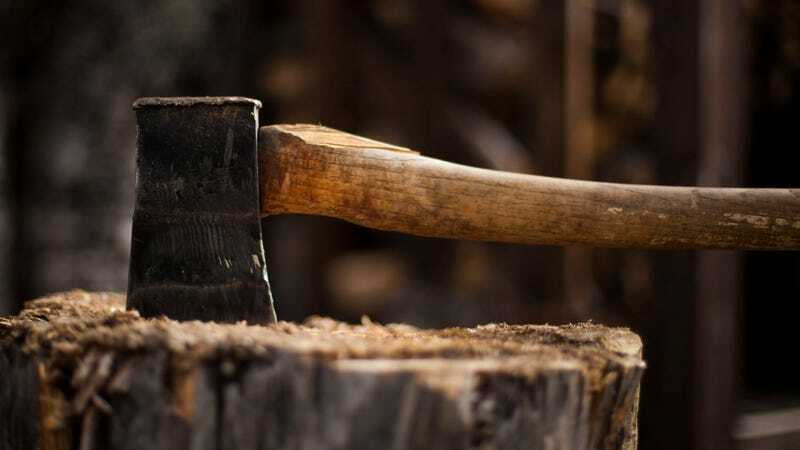 To have the best efficiency, you must find the knowledge about axe vs. hatchet that will help you select the best tools for specific jobs what they were intended for. Which one is easy to carry with? Before I disclose how to identify an axe and hatchet, let me define what axe and hatchet are. Axe is the most popular cutting tool which features a long handle made of either hickory wood or composite materials. And it has a tapered head made from metal, which usually weighs 3-6 pounds. An axe is a two-handed tool and is intended for cutting medium to vast woods. It would be an ideal choice for heavy and significant work for its bigger size. A hatchet is a small cutting device specially designed to be used with the single hand. It comes with a short handle made from both the hard hickory wood and the composite material. A hatchet includes somewhat a slender shape metallic head having a wider edge compared to the body of the head. A hatchet is meant for lighter work. To produce art and handicraft materials, a hatchet is the best suitable for its smaller size and can work from any angle. The difference in size of the hatchet and the axe is easily noticeable. The overall size of an axe is bigger than a hatchet. Axe handles are longer than that of the hatchet. The blade of an axe is wider than the blade of the hatchet. Depending upon the length of handle and blade of these tools, they become able of cutting from different angles. Since the head and handle of a hatchet are smaller than axe head and handle, it means a hatchet weighs less than an axe does. Hatchets are lighter in comparison with axes and are best suitable for light work while axes are for heavy work as they are heavier compared to hatchets. And varying in weight of these tools enables them to be used in different situations. It is common that the more weight of the head, the more force it produces when swinging, which gives more cutting in every strike. Despite the similarity in appearance of axes and hatchets, there are few technical differences in the shape of the head between them. Since hatchets are designed for few specific jobs, they feature a slim head with a relatively wider edge; and few use hammers on the opposite side of the head. On the other hand, axes never include hammerhead. And they have a larger head which tends to be slightly tapered from the opposite end to the head edge as the technical feature. One of the key differences between an ax and a hatchet lies in intended use. Axes are meant for cutting relatively big and hardwood since they are larger than hatchets whereas hatchets are mainly designed for chopping small log and wood. For fine work and handcraft, hatchets are best suitable thanks to their small size. A hatchet can be used with the replacement of an axe but would give poor performance and may make the blade dull since it is not designed for heavy work. Similarly, using an axe in a situation where a hatchet would be the best would bring lower efficiency as it is not intended for finer work. To be honest, both are easy to carry, but hatchets are more portable than axes, which is why many woodworking people call them as pocket-axe. One can carry a hatchet with belt or side pocket effortlessly to anywhere and there. But, due to the long handle, moving with an axe maybe sometime cumbersome for the part of a campaigner, even long handle can cause injury by hitting shins. By the definition of the axe, it is a tool made to be used with two hands to increase more cutting in every swing, applying more force. For hatchet, this is a device which is designed to be used with one hand for splitting small logs and branches, meaning that it consumes less energy and cuts less in every strike. Since hatchets are the one-handed tool, they can be used as a knife for making handcraft tools. Knowing the differences between an axe and a hatchet is very essential and would maximize your cutting efficiency. I think this article has already cleaned up misunderstandings about axe vs. hatchet. Once you have been able to differentiate a hatchet from an axe, you can identify their specific purposes what they were meant for. This will result in the best performance with less effort.